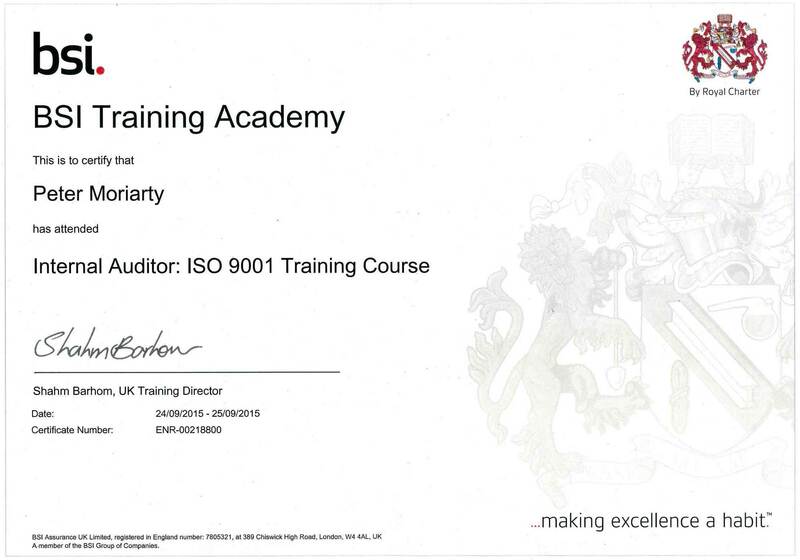 As the next step to achieving ISO9001:2008, SPS have engaged the services of world renowned British Standards Institute (BSI) to carry out a “pre certification” audit of its existing Quality Management System. This was duly carried out with no issues found but just a few suggestions for improvement. These suggestions have been taken on board and minor changes made. BSI have now been fully engaged to carry out stage 1 and stage 2 external auditing with a view to achieving certification in Q1 2016. In anticipation of seeking certification to ISO9001:2008, two SPS staff have attended BSI’s internal auditor course which was held over two days in York. Both Alan Yarker (Production and Quality Manager) and Peter Moriarty (Principal R&D Engineer) found the course to be very helpful in providing a structured approach to auditing. It also allowed them to get some specific key questions answered by people who had clearly been auditing for many years. Having fully trained internal auditors was viewed as being the first key step to achieving certification which is targeted at Q1 16. Having our own internal capability for high quality assembly of SMD PCBs for prototyping and small manufacturing batch runs has always been essential to meet customer lead times. Without a large multi-zone heater reflow oven and the possibility of tweaking parameters to optimise production yield, this is not a straightforward task. This has been compounded by the move to lead-free soldering and the same PCB having a large range of size and weight of components and tracking / flooding. Historically a modest size convection reflow oven has been used by SPS but it was apparent that a higher performance oven would be required for future use. An internal review of different reflow technologies was carried out by our production department and advice sought from various suppliers. After poor results from trialling a popular oven specifically designed for low volume / batch work, advice was sought from Electronics Yorkshire. They recommended using vapour phase technology which SPS was familiar with as a technology as it has been used for many years for soldering copper base plates to the underside of the DBC in isolated power modules.